Once you know you will be moving, the realization sets in that now you will have to box up everything in your home. Then, if you haven’t already, you will begin to understand why moving is considered one of the top most stressful events in a person’s life. With the right planning, you can avoid quite a bit of stress. 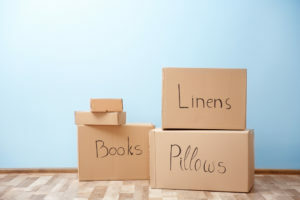 Here’s a few suggestions to help you curb the initial stages of moving – boxing up. As soon as your move has been confirmed and you have a move date, start packing. The process always takes longer than expected, so start now. You will thank yourself later. It is much less stressful to pack a few boxes everyday for two months, then a 2-3 day packing marathon the day before you move. It will take time to gather packing materials, i.e. boxes, tape, markers, packing paper, etc. Once you’ve got your materials, create an area in your home that you can be your designated ‘moving-room’. This room or area will be where you store all of your packed boxes as you finish them. It is also recommended that this be the same place you keep your packing materials, so you don’t spend valuable time hunting for the tape or markers. The benefit of this space is organization, you don’t want to live with boxes everywhere. Forts are only fun when they are voluntary. After the pre-packing decisions have been made, start packing you least needed items firsts. Large collections are the best. For example, your large bookshelves full of books that you haven’t read in awhile. You won’t have too much time for casual reading until your settled in your new place anyways. Then you could start with your fine china – you won’t be hosting too many fancy dinner parties either. Pack the knick knacks. You know, the stuff on your shelves and counters that really are just fillers and decoration. Feel free to keep the ones out that make it still feel like your home, like the ones on your nightstand that remind you of a weekend away, or the magnet on your fridge from that special family vacation, but just keep in mind that those will have to packed sooner or later. Bottom line: Find the things you don’t use that often and pack them up sooner, rather than later. Cheap tape isn’t worth it. Reusing boxes is a great way to save money – but only if they are in good condition. Label everything if you can, at least what room each box will go in. If not everything, at least the fragile stuff and what you will need the first day, i.e. sheets, clothes, kitchen bowels for cereal, etc. A big box should be packed light. A small box can be packed heavy. Whoever ends up loading/unloading will thank you. You’re belongings are more likely to make the move without breaking, too. Keep your blankets and towels unpacked. You can use these to wrap your fragile items. Don’t empty dresser draws. Find a way to tape the drawers shut, or wrap the dresser securely with stretch wrap or moving blankets. This saves you so much time. Don’t take your hanging clothes off of the hangers. It’s very easy to find wardrobe boxes that allow you to take your clothes out of your closet, hang them in a box, and take them from the box and hang them in your new closet. If you don’t need a wardrobe box, lay you clothes flat in the backseat of your car, it’s the same principle. If you have friends you can trust who are willing help, let them. Have at least a fuzzy plan of the items you trust them to pack and offer to buy them pizza and drinks, turn the music up, and have fun. Making this process fun when you can is important. In summary, take some time to gather materials and create a moving space, start packing immediately, buy good tape, and let your friends help where they can.